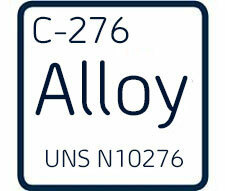 Inconel® Alloy C-276 (UNS N10276/W.Nr. 2.4819 )is known for its outstanding corrosion resistance in a wide range of severe media. The high nickel and molybdenum contents provide good corrosion resistance in reducing environments while chromium imparts resistance to oxidizing media. The molybdenum also aids resistance to localized corrosion such as pitting. The low carbon content minimizes carbide precipitation during welding to maintain resistance to corrosion (intergranular attack) in heat-affected zones of welded joints. Inconel® Alloy C-276 is widely used in the severest environments encountered in chemical processing, pollution control, pulp and paper production, industrial and municipal waste treatment and recovery of “sour” natural gas. Applications in air-pollution include stack liners, ducts, dampers, scrubbers, stack-gas reheaters, fans and fan housings. In chemical processing, the alloy is used for numerous components including heat exchangers, reaction vessels, evaporators, and transfer piping. In sour gas wells (those containing hydrogen sulfide), Inconel Alloy 020 delivers a high level of performance in various downhole and surface components including tubing, coupling, and subsurface safety valves. Inconel® Alloy C-276 is resistant to general corrosion, stress corrosion cracking, pitting and crevice corrosion in a broad range of severe environments. Its resistance to carbide precipitation during welding maintains corrosion resistance in the heat-affected zones of welded joints. It has exceptional resistance to sulfuric acid and hydrochloric acid. It resists many of the most severe media encountered in chemical processing, including reducing and oxidizing acids, highly oxidizing, neutral, and acid chlorides, solvents, formic and acetic acids, acetic anhydride, wet chlorine gas, hypochlorites, and chlorine solutions. It has excellent resistance to phosphoric acid. At all temperatures below the boiling point and at concentrations lower than 65 wt %, tests have shown corrosion rates of less than 5 mpy (0.13 mm/y). Inconel® Alloy C-276 exhibits excellent resistance to corrosion by seawater especially under crevice conditions which induce attack in other commonly used materials such as 316 stainless steel, MONEL® alloy 400, and Inconel® Alloy 625.